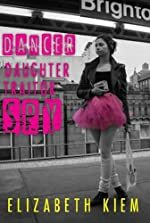 Dancer Daughter Traitor Spy by Elizabeth Kiem. Review: Do you want to read a book about a girl who has to multitask every day? If so then Dancer, Daughter, Traitor, Spy by Elizabeth Kiem is a good book for you. It is about a girl named Marina. Marina and her father have to escape Russia and Soviet Union. Her mother was born with a special gift and Marina has it too. When Marina and her father arrive in America she wants to become a dancer again. Her father enrolls her in a high school and she quickly makes some friends. She goes to an audition for the American Ballet School. She has a vision of something bad and now she has to decide whom she can and can't trust. What does the vision bring and how will it affect Marina? Who will she trust? I liked the book and its story line. But this book will better appeal to girls rather than boys. Some boys may like the book because there is some action in the plot. Dancer, Daughter, Traitor, Spy is probably intended for girls ages 10 to 13. Dancer, Daughter, Traitor, Spy has a few high level words and has some Russian in it. The book made me smile when Marina was dancing again. Overall I enjoyed Dancer, Daughter, Traitor, Spy and I hope you will too. It was a great book and girls and boys may appeal to it. We would like to thank Soho Teen for providing a copy of Dancer Daughter Traitor Spy for this review. Have you read Dancer Daughter Traitor Spy? How would you rate it?